Aside from Truly Rich Club, I like reading articles and blogs from other Filipino Financial mentors, and one on my list is Randell Tiongson. 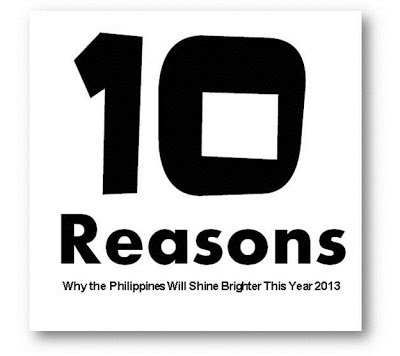 Let me share you here his post about 10 Reasons Why the Philippines Will Shine Brighter This Year 2013. I believe this year will going to be tough and prosperous. Let's claim that every single day of 2013. But again, there could always be a loom and gloom stories. Of course we want more positive compare to the other side. Think positive. Here's 10 Reasons Why the Philippines Will Shine Brighter This Year 2013. "2013 is turning out to be a great year for the Philippines. Mike Manuel, Chief Investment Officer of Sun Life Asia listed down 10 reasons why he thinks “The Philippines Will Shine Brighter This Year”. 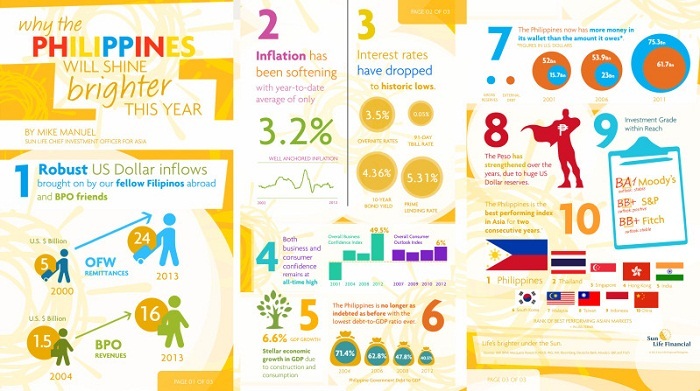 The Philippines is the best performing index for two consecutive years"
Below is a nice ‘infographic’ with details from Sun Life. The reason why we need to shine is not just for our selves, but for the benefits of our future generation. For the future of our children, and their children too.